Do you know what your company’s Quality Score is? Do you know what a negative keyword is? If you have never taken advantage of the revolutionary marketing tool know as Google AdWords, you have no use for those terms. Google AdWords can be a highly effective, short-term investment if you have a clear goal before getting started. Google AdWords is an online advertising service that positions your business ad in a premium place alongside search results. 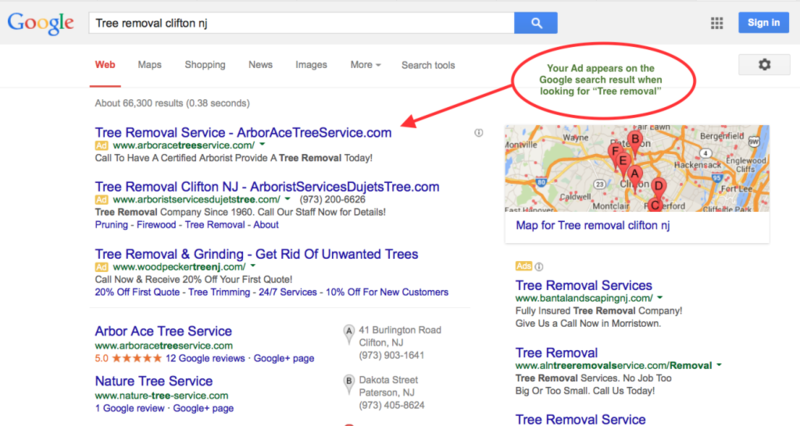 For example, if a Tree Service company creates an AdWords campaign around the keyword tree removal, their ad would be at the top of a search results page for the phrase “ Tree Removal” (within the specified area and audience you chose). How does Google determine which ads get top placement? Google determines placement of ads on Ad Rank, a combination of variables maintained by an Account Manager Your Ad Rank is based on the quality of your website and ad, the amount you are willing to spend, and the expected impact from your ad extensions or formats. How can you be sure that your ad is quality? Having a website full of original content, with different types of media, optimized for SEO, will create a quality landing page for your Ad. Google places a high premium on original quality content; so if you have a wealth of information on your website, your ad may be ranked higher. Ads that rank highest end up at top of the search results page. Is Google AdWords for your company or brand? Google AdWords, simply stated, is a pay-per-click advertising service that allows you to control placement. If you work closely with your Account Manager you will have optimized results, but it is important to paractice patience during the beginning stages. How can you determine that Google AdWords is right for your business. The flexibility of AdWords may not be for every company or brand, but if you enjoy the ability to change your campaign, then this is the advertising option for you. Google AdWords is extremely flexible and measurable, so you can change or stop and add campaigns that are not working. The pressure of staying within a budget is a stress for any business, so it can come as a relief to have such control on spending limits. Communication is key in this aspect of AdWords, and your Account manager will track what is or isn’t working with the extensive tracking tools that Google provides. If you need fast results, This is a program that will work for you. Combine carefully chosen keywords and aggressive bidding, and your campaign will fare well in a short time frame.